The Track Applications page of your Reseller Console allows you to monitor the progress of merchant applications that you have submitted for processing. You can search your merchant application list, view and delete individual applications and easily track all of your merchant applications as they make their way from beginning to end of the application process. 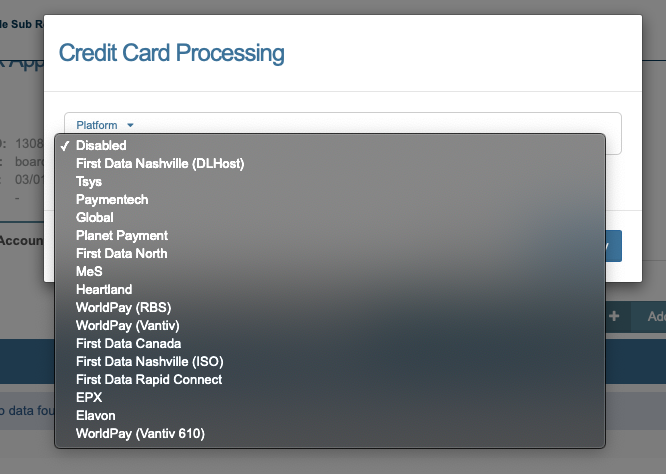 The list of merchant applications stored in the Track Applications page are grouped together by status (i.e. Pending, Approved, etc.) and within those groupings, they can be sorted by Company (default), Contact, Credit Card Processing Platform, or the date on which the application was last updated. Click the column header to reorder the list. The total number of applications currently in the system is displayed to the top right of the column headers. If your account is enabled for multiple resellers, the bar at the top of the merchant application list will alert you to which reseller accounts are being reported on in the merchant application tracking system. To change which resellers are included in this section, click on the bar and you will be able to move resellers from a list of "available resellers" to "selected resellers" and vice versa. Simply click on the reseller that you would like to add or remove from the track applications list and click on the corresponding button. When you have selected the desired resellers to include in the "selected resellers" list, simply click the save button to preserve your changes and return to the list of applications. If you do not wish to save your changes, click Cancel and your changes will be discarded and you will be returned to the list of merchant applications. To find a particular merchant application, simply enter your search term into the field provided at the top of the merchant application list and click the find button. You can search by merchant Contact or Company. To view the details of any of your merchant applications, click on the View button to the right of the application. You will be able to view the following tabs: General, Accounts, Billing, Source Keys, Equipment, Fraud Modules, Notes. If you have the necessary permissions, you can edit new merchant applications to make corrections or to add multiple merchants with similar information. The General information tab includes basic details about the merchant application such as Company name and Contact, address, phone number and other contact information. Status Status of merchant application, e.g. Pending, Approved, etc. The accounts tab details the specifics of the merchant's new account including credit, debit, check and direct payment processing platforms. To select or alter section of a platform, choose the platform you want, then click the blue reload arrow to the right of your selection to reload the page and enter platform specific details. To enable debit card processing for the merchant account, check the box labeled "Enabled" in the Debit Processing section. Select the merchant's check processing platform (if any). 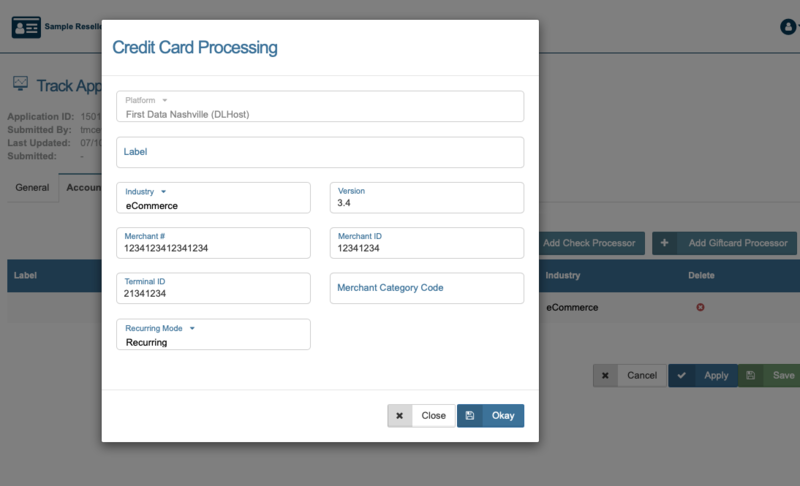 Fill in the necessary details for the merchant's check processing platform account. 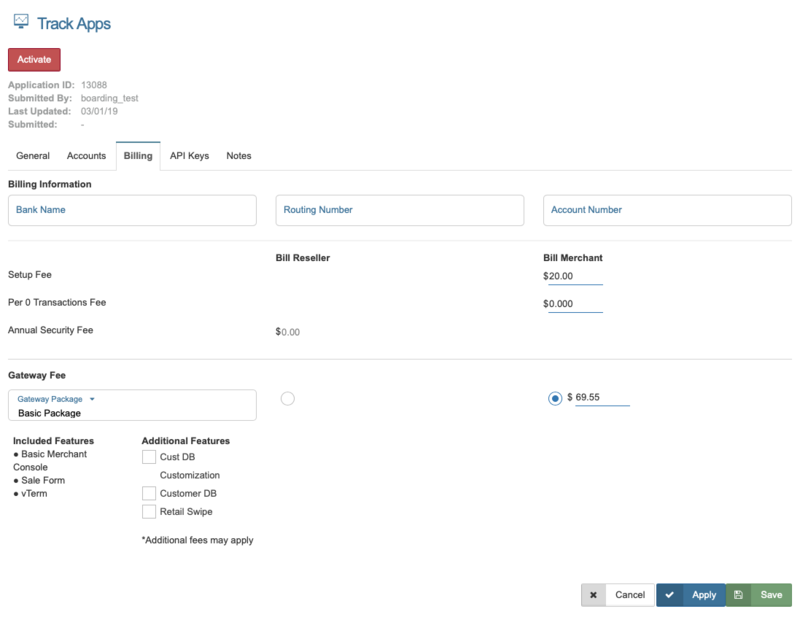 This section displays the merchant's billing information and fee settings. All fees are established when the initial Reseller account is created. To bill the merchant for all or part of a specific fee, simply select the "Bill Merchant" button and enter the amount you would like the merchant to pay. You can charge the merchant the full amount, or a percentage of whichever fees you like. A suggested charge will appear when you click the Bill Merchant button for each of the fees, but you can change the amount to whatever you like. You can also establish a default amount to charge new merchants in the Settings page of your console. There are four different Gateway Packages available for merchants. For more information about gateway packages please visit Settings: Gateway Packages. The Platinum Gateway Package includes the highest number of features: everything your new merchant could possibly need for a superior console experience. With this option the merchant has unlimited access to all available features of their merchant console including extended fraud protection, customizable reports, fully functional customer database and batch upload functionality. The Platinum Gateway Package is also the most economical and allows you to charge the merchant a lower price while offering them the highest functionality so that they can get the most from their Merchant Console. The Gold Gateway Package with Customer Database includes all of the basic Merchant Console functions, as well as customizable reports and full access to the customer database. For additional fees your merchant can also select batch upload functionality and/or extended fraud protection. The Gold Gateway Package with Extended Fraud Protection includes all of the basic Merchant Console functions, as well as customizable reports and fully functioning extended fraud protection. As the base gateway package, Silver provides all basic Merchant Console functions and can be modified to include batch upload functionality, customer database access, customizable reports and/or extended fraud protection. The Source Key Editor allows you to add and edit source keys for your merchant application. You can add or edit any of the merchant's internal system sources - such as the vTerminal or QuickSale - as well as any external sources - such as a Point of Sale system, Shopping Cart, eStore or Payment Form. Each source is assigned a unique Key by the system which is used to identify the source of each transaction when it is processed through the gateway. Merchants can also run reports using the Source as a factor in order to find out where the majority of their transactions originate. On the source editor screen in the Track Applications section of your console you will see the name of each source that has been entered along with its status (enabled or disabled), whether the source has been assigned a PIN, the source's default currency, and an "Edit" and "Delete" button for each source. There is also an "Add Source" button as well as "Save" (save all changes and return to main Track Applications page), "Apply" (save all changes and remain on Source Keys tab), and "Cancel" (do not save changes and return to main Track Applications page). To add a new source to the system and generate a key for the new source, click the Add Source button at the bottom of the screen. You will be taken to a page with several sections which are outlined below. To edit an existing source key, click the Edit button to the right of the source key. Enter or alter the required information into the form(s) provided and click Apply when you are done. The system will automatically generate a key for the new source and it will be added to the source list. In the first form, enter the basic source information such as what the source will be named (we recommend that you use something descriptive and easy to remember, i.e. Toy Order Form, or P.O.S. Station 2), the pin number (if any) and whether the source should be disabled, or run in test mode. Next you will select the commands that the specific source will be permitted to process. This choice should be based on a number of possibilities, such as who will be using the source, how public it is, and any specific fraud modules you plan to add to the course once it has been set up. Below is a list of Commands and their Descriptions. At this point you may choose to Save, Cancel, or Apply your changes, or, if the source you are creating/editing is a payment form, continue on and customize the merchant's payment form. In this section you can create a title for the payment form, customize the appearance of the form and change any aspect of the form to make it work best for your merchant and their business. Once you have applied your changes, a link to the form will appear at the top of this section, however, you may use the "Preview ePay Form" button at the bottom of the section to view your changes at any time. From the preview screen, use your browser's back button to return to the source editor. You can change the color of the form's background, header, section headers, text, links, header text and form background, by simply entering the hexadecimal color codes in the spaces provided. When selecting colors we recommend using a palate that coordinates with the merchant's website and is easy for customers to read. Click here for a complete hexadecimal color guide. You can further customize both the form itself and the displayed result page by clicking the Customize ePay Form at the bottom right of this section. You will be taken to a tabbed HTML field, with one tab for the form, and the other for the result page. Any of the HTML can then be edited to your specifications. The result code includes responses for multiple outcomes such as approved, declined, or unable to process. Please note: This option is recommended for experienced users only. If you want to customize your form, but are not sure of how to proceed, please contact your USA ePay sales representative. 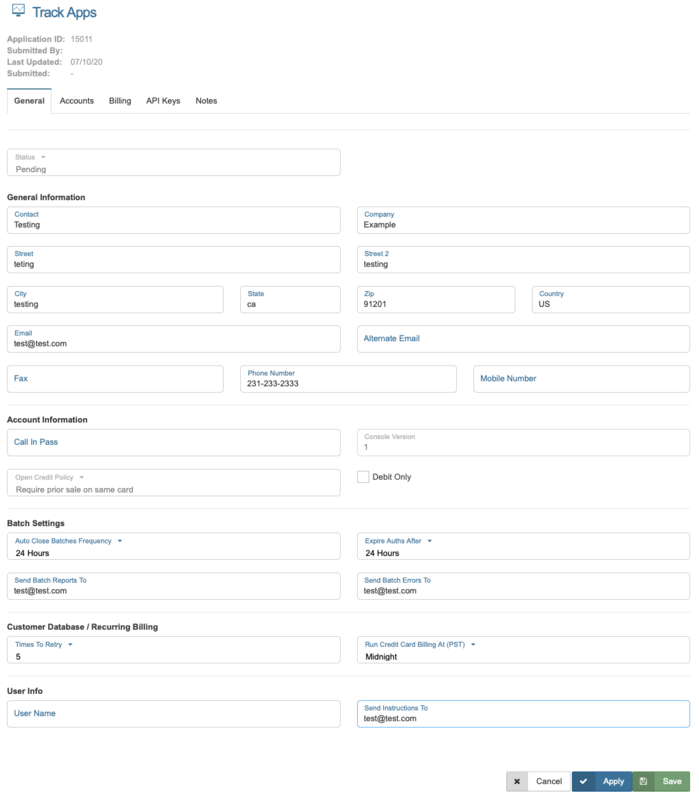 The payment form settings determine how the form transaction results are submitted, and where the customer is directed once they have clicked the submit button at the bottom of the form. Approved URL: Enter the complete URL (include all parts of the URL beginning with http:// -i.e. http://www.yourwebsite.com/approvalpage.html) of the page to which the customer should be redirected once their successful transaction has received approval from the gateway. Declined URL: Enter the complete URL of the page to which the customer should be redirected should their transaction result in a decline. Homepage URL: Enter the complete URL of the homepage of your existing website. This link will be used wherever a "Home" link is required. In this section you can select the payment methods that will be accepted by this source. The options include: Visa, MasterCard, American Express, Discover, Diner's Club, JCB and e-Checks. The declined template field is only required is you are using a client-side API. The template must be entered here in HTML format and will be displayed to the customer if UMredirApproved is set but UMredirDeclined is not. There is no restriction on length. "[reason]" will be replaced with a text description of the error. Please note: The Declined Template is not a required part of the ePay Form. Most users will not need to use the Declined Template field. The required fields section allows you to determine which fields of your payment form must be filled in correctly before the form will be accepted. There are two drop down menus and one space for including a descriptive error message for your customers, should they skip a required field. Value Required - as long as something has been entered in the field it will be accepted. Letters Only - allows only letters to be entered in the specified field, if other characters are entered (including spaces) in the field, it will be rejected. Numbers Only - allows only numbers to be entered in the specified field, if other characters are entered (including spaces) in the field, it will be rejected. Letters & Numbers Only - only numbers and letters are allows, no other characters such as @ or % will be permitted. Letters, Numbers & Spaces - only letters, numbers and spaces will be permitted. US Phone Number - only a valid US phone number will be accepted. US Zip Code - only a valid US zip code will be accepted (may be used to prevent foreign order for merchants who do not ship overseas). Canadian Zip Code - only a valid Canadian zip code will be accepted. US or Canadian Zip Code - only a valid US or Canadian zip code will be accepted. Custom - custom requirements may be set using perl regular expressions. This requirement may be used to ensure that customers enter information in an acceptable format, such as the common date format: DDMMYYYY. Once you have entered a required field, it will appear in the list above the drop down menus with a trash can icon to the far right. Should you need to delete or edit the required field, simply click on the trash can and the field will be instantly deleted. It can then be replaced with a corrected required field if desired. The Duplicate Transaction Handling settings allow you to prevent fraud by catching similar or identical transactions occurring within a set period of time. However, if you are already using the Duplicate Detection fraud module, you must set the Source Duplicate Transaction Handling to "none." To set the Duplicate Transaction Handling to catch transactions first select either "Fold duplicate if ALL transaction data matches," or "Fold duplicate if card number and amount match," from the Handling drop-down menu. Then enter the time limit in the space provided, for example, if you set the handling to "Fold duplicate if ALL transaction data matches" and enter 5 minutes (the default), then any transactions with identical data that run within five (5) minutes of each other will be folded and run only once. This setting allows you to restrict the number of computers on which this source key can be used. To allow all IPs to run transactions, leave blank. To specify only certain IPs, enter each permitted IP on a separate line in the space provided. Granting only certain IPs permission to run transactions with this particular source key may prevent fraud. From this tab you can purchase equipment and supplies for your merchant by clicking on the "Order Equipment and Supplies" icon to go to the Reseller Store as well as view orders in progress. 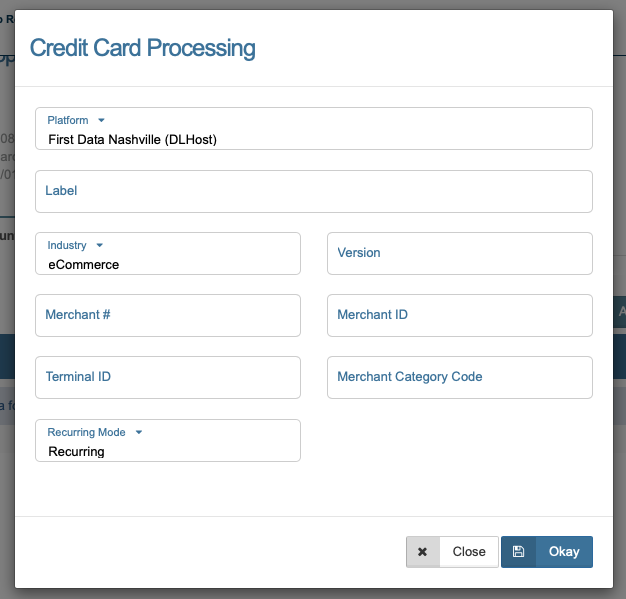 Add Fraud Modules to each of your new merchant accounts. The Notes tab can be used to communicate or record important details about the merchant application. Each note will be posted to the notes tab and tagged with a time stamp and your username. Click on the Delete button to the right of the source you would like to delete. A window will open asking you to confirm this deletion. Please Note: Once a source key has been deleted from the system, any software such as Wireless ePay, ePay Charge or third party shopping carts that was configured to use the source key will no longer be able to process transactions. To delete a merchant application, click the Delete button to the right of the application you wish to delete. You will be taken to a confirmation screen where you can click Okay to continue, or Cancel to stop the deletion process and return to the track applications screen. If you choose to delete an application, the unprocessed application record with be stored in our database for thirty (30) days.